Our automotive anti-vibration rubber parts respond to our customers' demands for high performance and quality with sophisticated technology and high development capability by utilizing the collective strength within the group globally. Product that has been worldwide adopted and trusted by our customers is distributed through our global network, including the domestic of India. Bridgestone India Automotive Products Pvt. Ltd. has two production sites in India located in Chennai and Manesar. 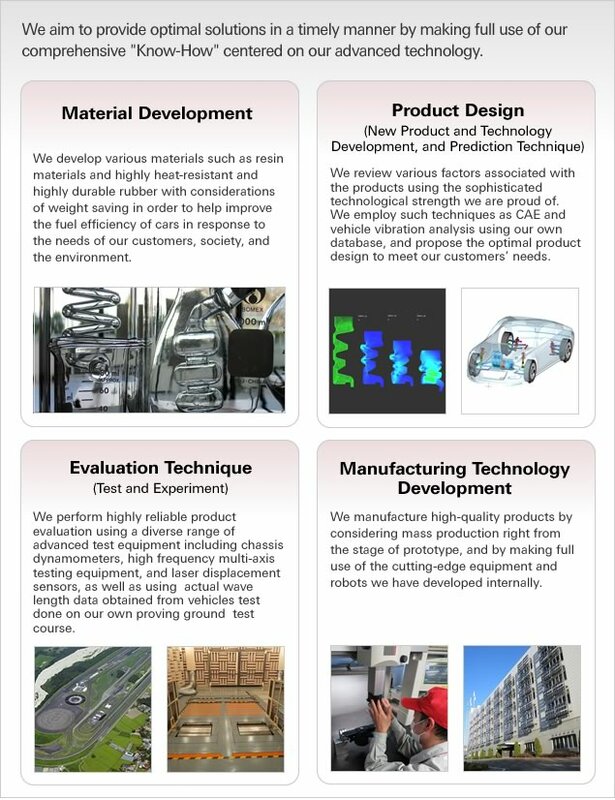 We supply our products to reputed car manufacturing companies in India. Our global headquarters, technical center, and distribution outlets for domestic customers are in place in Japan. 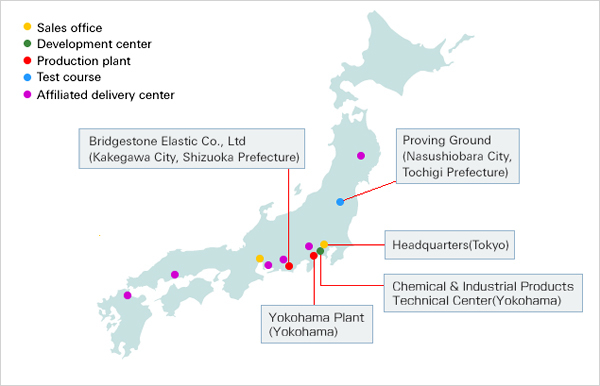 With two production bases, including our Yokohama Plant and the mother plant at Bridgestone Elastic Co., Ltd., we supply our products in a timely fashion to our customers through delivery centers throughout the country. Also respond to various needs from our customers through our unique approach including vehicle testing on our own test course. Bridgestone Group expanded their local production capabilities overseas to meet the product supply need to accompany our customers' global expansion. 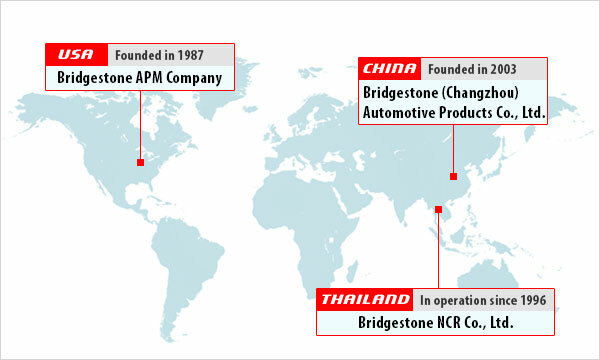 Bridgestone also have production sites in three countries, namely the U.S.A., Thailand and China, thus contributing to our customers' productivity in each region. The origin of our anti-vibration rubber parts production dates back to the time when shock-absorbing rubber parts for naval airplanes were experimentally manufactured in 1937. Subsequently, in 1940, we started manufacturing anti-vibration rubber parts in our Yokohama Plant. After interruption during the closing days of World War II, we resumed production in the same plant in 1952. Since then, along with the high economic growth and the remarkable growth of the automobile industry in Japan, we have steadily expanded our business by supplying high quality products with excellent performance. Started experimental production of shock-absorbing rubber parts (anti-vibration parts) for naval airplanes. Started manufacturing of anti-vibration rubber parts in the Yokohama Plant. Completed a plant exclusively manufacturing anti-vibration rubber parts within the Yokohama Plant. Founded Bridgestone Clevite Co. (present Bridgestone Elastic Co., Ltd.) in Ogasa County, Shizuoka Prefecture (present Kakegawa City, Shizuoka Prefecture). Developed anti-vibration rubber made of compounded rubber that improves both automotive steering stability and riding comfort. Launched air springs (the ASL air sleeve) in the market. Founded Clevite-Bridgestone Co. (present BAPM) in Ohio, U.S.A. Launched plastic resin bond anti-vibration rubber parts (pitching stoppers) in the market. Completed the development of round-type fluid engine mounts and started up the manufacturing line. Developed a new vulcanization method (RIACS) which allows proper vulcanization of anti-vibration rubber parts and enhanced productivity. Started manufacturing anti-vibration rubber parts at BSNCR in Thailand. Developed the Active Control Mount "ACM" mounting system. Started operation of the No. 2 anti-vibration rubber plant in Ohio, U.S.A. Founded Bridgestone (Changzhou) Automotive Products Co., Ltd. (BCAP) in Jiangsu, China. Jointly founded a company, BSTVS (present Bridgestone India Automotive), with Sundaram in India. 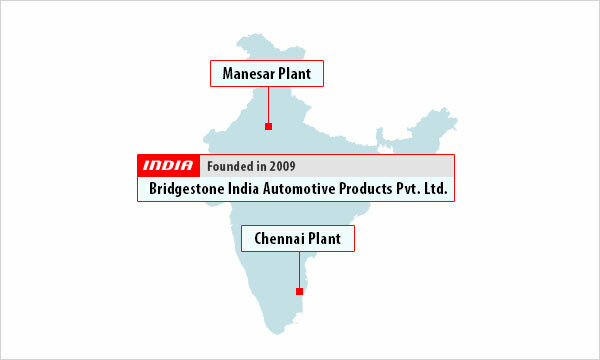 From August 2012 the company (Bridgestone India Automotive) is a 100% subsidiary of Bridgestone Corporation, Japan. Consolidated the No. 1 and No. 2 plants in Ohio, U.S.A. Formed the new HQ and the Technical Center. Bridgestone Corporation has formed a joint venture company in Indonesia with PT Astra Otoparts Tbk. The company has started operation from August 2015.